Your letter of 24th July, concerning the questioning of certain truths was communicated through the good offices of our secretariat to all our major superiors. Few replies have reached us. Those which have come to us from Africa do not deny that there is great confusion of mind at the present time. Even if these truths do not appear to be called in question, we are witnessing in practice a diminution of fervour and of regularity in receiving the sacraments, above all the Sacrament of Penance. A greatly diminished respect for the Holy Eucharist is found, above all on the part of priests, and a scarcity of priestly vocations in Frenchspeaking missions: vocations in the English and Portuguese-speaking missions are less affected by the new spirit, but already the magazines and newspapers are spreading the most advanced theories. It would seem that the reason for the small number of replies received is due to the difficulty in grasping these errors which have spread everywhere; the root of the evil lies chiefly in a literature which sows confusion in the mind by descriptions which are ambiguous and equivocal, but under the cloak of which one discovers a new religion. I believe it my duty to put before you fully and clearly what is evident from my conversations with numerous bishops, priests and laymen in Europe and in Africa and which emerges also from what I have read in English and French territories. I would willingly follow the order of the truths listed in your letter, but I venture to say that the present evil appears to be much more serious than the denial or calling in question of any particular truth of our faith. In these times it shows itself in an extreme confusion of ideas, in the breaking up of the Church’s institutions, religious foundations, seminaries, Catholic schools; in Reply of Mgr. Marcel Lefebvre to Cardinal Ottaviani after the Council short, of what has been the permanent support of the Church. It is nothing less than the logical continuation of the heresies and errors which have been undermining the Church in recent centuries, especially since the Liberalism of the last century which has striven at all costs to reconcile the Church with the ideas that led to the French Revolution. To the measure in which the Church has opposed these ideas, which run counter to sound philosophy and theology, she has made progress; on the other hand, any compromise with these subversive ideas has brought about an alignment of the Church with civil law with the attendant danger of enslaving her to civil society. Moreover, every time that groups of Catholics have allowed themselves to be attracted by these myths, the Popes have courageously called them to order, enlightening and, if necessary, condemning them. Catholic Liberalism was condemned by Pius IX, Modernism by Leo XIII, the Sillon Movement by St. Pius X, Communism by Pius XI and Neo-Modernisrn by Pius XII. Thanks to this admirable vigilance, the Church grew firm and spread: conversions of pagans and Protestants were very numerous, heresy was completely routed, states accepted a more Catholic legislation. Groups of religious imbued with these false ideas, however, succeeded in infiltrating them into Catholic Action and into the seminaries, thanks to a certain indulgence on the part of the bishops and the tolerance of certain Roman authorities. Soon it would be from among such priests that the bishops would be chosen. This was the point at which the Council found itself while preparing, by preliminary commissions, to proclaim the truth in the face of such errors in order to banish them from the midst of the Church for a long time to come. This would have been the end of Protestantism and the beginning of a new and fruitful era for the Church. Now this preparation was odiously rejected in order to make way for the gravest tragedy the Church has ever suffered. 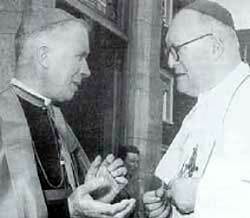 We have lived to see the marriage of the Catholic Church with Liberal ideas. It would be to deny the evidence, to be willfully blind, not to state courageously that the Council has allowed those who profess the errors and tendencies condemned by the Popes named above, legitimately to believe that their doctrines were approved and sanctioned. In a more or less general way, where the Council has introduced innovations, it has unsettled the certainty of truths taught by the authentic Magisterium of the Church as unquestionably belonging to the treasure of Tradition. The transmission of the jurisdiction of the bishops, the two sources of Revelation, the inspiration of Scripture, the necessity of grace for justification, the necessity of Catholic baptism, the life of grace among heretics, schismatics and pagans, the purpose of marriage, religious liberty, the last ends, etc. On all these fundamental points the traditional doctrine was clear and unanimously taught in Catholic universities. Now, numerous texts of the Council on these truths will henceforward permit doubt to be cast upon them. doubts about the necessity of the Church and the sacraments have led to the disappearance of priestly vocations. doubts on the necessity for and nature of the “conversion” of every soul involve the disappearance of religious vocations, the destruction of traditional spirituality in the novitiates, and the sterility of the missions. doubts on the lawfulness of authority and the need for obedience, caused by the exaltation of human dignity, the autonomy of conscience and liberty, are unsettling all societies, beginning with the Church religious societies, dioceses, secular society, the family. Pride has as its normal consequence the concupiscence of the eyes and the flesh. It is perhaps one of the most appalling signs of our age to see to what moral decadence the majority of Catholic publications have fallen. They speak without any restraint of sexuality, of birth control by every method, of the lawfulness of divorce, of mixed education, of flirtation, of dances as a necessary means of Christian upbringing, of the celibacy of the clergy, etc. Doubts on the necessity of grace in order to be saved cause baptism to be held in low esteem, so that for the future it is to be put off until later, and occasion the neglect of the sacrament of Penance. Moreover, this is particularly an attitude of the clergy and not the faithful. It is the same with regard to the Real Presence: it is the clergy who act as though they no longer believe by hiding away the Blessed Sacrament, by suppressing all marks of respect towards the Sacred Species and all ceremonies in Its honour. Doubts on the necessity of the Church, the sole source of salvation, on the Catholic Church as the only true religion, emanating from the declarations on ecumenism and religious liberty are destroying the authority of the Church’s Magisterium. In fact, Rome is no longer the unique and necessary Magistra Veritatis. Thus, driven to this by the facts, we are forced to conclude that the Council has encouraged, in an inconceivable manner, the spreading of Liberal errors. Faith, morals and ecclesiastical discipline are shaken to their foundations, fulfilling the predictions of all the Popes. The destruction of the Church is advancing at a rapid pace. By giving an exaggerated authority to the episcopal conferences, the Sovereign Pontiff has rendered himself powerless. What painful lessons in one single year! Yet the Successor of Peter and he alone can save the Church. Let the Holy Father surround himself with strong defenders of the faith: let him appoint them to the important dioceses. Let him by documents of outstanding importance proclaim the truth, search out error without fear of contradictions, without fear of schisms, without fear of calling in question the pastoral dispositions of the Council. Let the Holy Father deign: to encourage the bishops to correct faith and morals, each individually in his respective diocese as it behoves every good pastor to uphold the courageous bishops, to urge them to reform their seminaries and to restore them to the study of St. Thomas; to encourage Superiors General to maintain in novitiates and communities the fundamental principles of all Christian asceticism, and above all, obedience; to encourage the development of Catholic schools, a press informed by sound doctrine, associations of Christian families; and finally, to rebuke the instigators of errors and reduce them to silence. The Wednesday allocutions cannot replace encyclicals, decrees and letters to the bishops. Doubtless I am reckless in expressing myself in this manner! But it is with ardent love that I compose these lines, love of God’s glory, love of Jesus, love of Mary, of the Church, of the Successor of Peter, Bishop of Rome, Vicar of Jesus Christ. May the Holy Ghost, to Whom our Congregation is dedicated, deign to come to the assistance of the Pastor of the Universal Church. May Your Eminence deign to accept the assurance of my most respectful devotion in Our Lord. 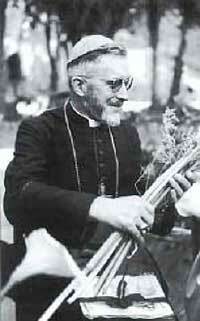 Superior General of the Congregation of the Holy Ghost.